Guests catching up over refreshments at The Oakhurst Insurance George Arts Theatre’s 50th anniversary gala evening. 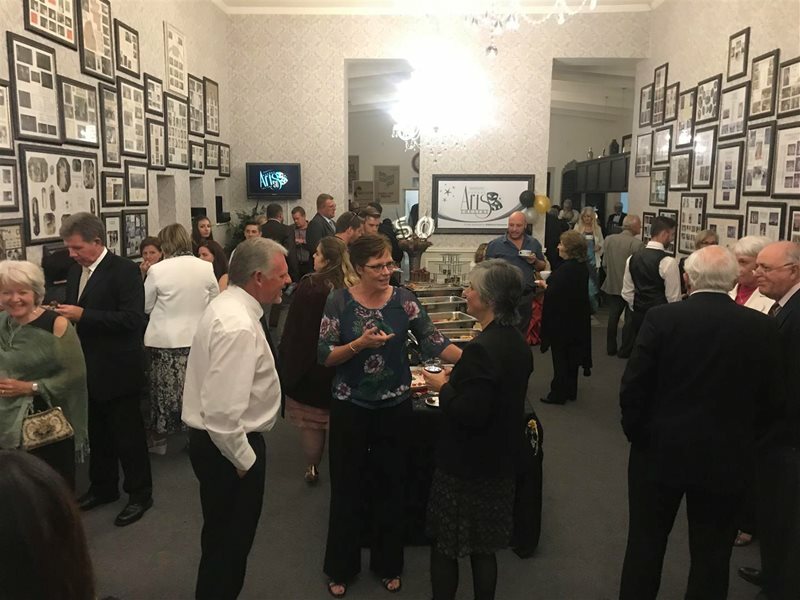 GEORGE ENTERTAINMENT NEWS - As part of its 50th anniversary celebrations and to place a spotlight on its many achievements, the Oakhurst Insurance George Arts Theatre hosted a gala evening for honorary members, dignitaries and the George community on Saturday 6 April. Among those attending were George Executive Mayor, Melvin Naik and Managing Executive of Oakhurst Insurance, Peter Grindlay who enjoyed the warm atmosphere and avant-garde setting that only this charming Theatre could provide. Dressed to the nines, guests got to reconnect with one another upon their arrival before moving into the Theatre. Madie Calitz, Chairperson of the George Arts Society, welcomed and thanked the George community as well as her Theatre colleagues for being an integral part of the Oakhurst Insurance George Arts Theatre’s history. Next on stage was Managing Executive of Oakhurst Insurance, Peter Grindlay who reiterated the reason they are so committed to the Theatre and congratulated the people who have kept it alive for the past 50 years. Before the curtain was raised George Executive Mayor, Melvin Naik acknowledged and toasted the memories of those members who had passed on before making a final toast to the Theatre’s staff for their commitment. It was then time for the much-awaited performance of The Sleeping Prince. This royal love story was made famous by Marilyn Monroe and had a special significance as it was the first-ever production that was put on the Theatre’s stage. Oakhurst Insurance staff member Riaan Reyneke made his team proud after his performance in The Sleeping Prince with co-actor and Chairperson of the George Arts Society, Madie Calitz. Left to right: Ryan Passanah, Shawn Carr, Elaine Grindlay, Peter Grindlay, Riaan Reyneke and Madie Calitz. The Oakhurst Insurance George Arts Theatre has created many great memories over the years and for decades now has nurtured a vibrant amateur dramatics culture. It is one of South Africa’s last-standing independent community theatres and has had many professional actors fine-tune their craft on its stage. Thanks to the partnership and investment by Oakhurst Insurance, the Theatre underwent a big metamorphosis in 2014 when it was revamped and restored to a premier performing arts venue, without losing its authenticity. Since then, the Theatre has been known as the Oakhurst Insurance George Arts Theatre. “Phase 1” of the renovations included painting the exterior as well as renovating and redecorating the foyer and front of house area. An extension was also built between the Theatre building and the wardrobe area. This new area was named "The Backstage Lounge Café". This generous commitment has allowed nationally and internationally acclaimed artists to perform at the Theatre. Madie Calitz, Chairperson of the George Arts Society, dressed in one of the Theatre’s own creations, welcoming and thanking the George community. In 2017 the Theatre underwent its “Phase 2” restoration which included the revamp of the stage and seating area as well as performer’s changing rooms which received a much-needed make-over. “Phase 3” restoration commenced in early 2019 with the refurbishment of the bathrooms. The George community is invited to get involved in celebrations by attending one of 2019’s enchanting productions which are guaranteed to dazzle. The line-up begins with April’s performances of The Sleeping Prince, followed in June by a rip-roaring production of Little Shop of Horrors - the tale of Seymour and his delightful flower, that acquires a taste for humans. A variety show (with a twist of cabaret) is set to delight audiences in September, and December’s traditional pantomime will bring down the curtain on 2019. “The Oakhurst Insurance George Arts Theatre’s purpose is to feed the artistic soul of the community at every level and this year is dedicated to celebrating 50 years of doing just that. We are a Non-Profit Public Benefits Organisation and would not have survived without the support of our local companies and individuals. We want these celebrations to remind everyone about the vital role theatre plays in our lives.” said Madie Calitz, Chairperson of the George Arts Society. Actors of the The Sleeping Prince did an outstanding job in recreating this theatre classic. There is something for everyone in 2019 at the Oakhurst Insurance George Arts Theatre, as it celebrates its 50th year in style. To book your seat for one of these productions or to make use of the Theatre for a private or corporate function such as a wedding or a conference, please email info@georgeartstheatre.co.za or call 044 878 3142. You can also visit the website to find out more about this year’s shows.